Come away with us on an adventure with God! The 2018 Parish Retreat will give us each an opportunity to reflect on our spiritual journey. Where have you been, and where are you now? Most importantly, where do you hope to go in your life with God? Choose your own adventure! 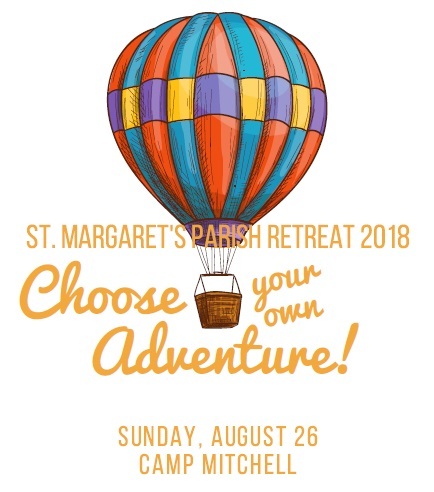 Come Saturday, August 25th at 5:00 p.m. for an overnight retreat at Camp Mitchell, or join us on Sunday, August 26th from 9:30 a.m. - 7:00 p.m. for a one-day retreat. There will be activities for all ages, including childcare for young ones. Meals will be provided by Camp Mitchell. Space is limited for overnight guests, so register soon! Deadline to register is August 15th.